I'm trying to flash a boot-loader on a Planck Light keyboard, it shipped without a boot-loader. I get a verification error when I try to flash it. I have tried running this: sudo avrdude -p usb1286 -c usbtiny -U flash:r:mystery.hex:r to see if the bootloader is getting flashed at all. When I run this command the file that gets returned is blank. There's nothing in it. No boot-loader. So I'm not sure if I'm even writing to the bootloader, or if I'm unable to read it. However, If I flash another boot-loader, one called bootloader_atmega16u4_1_0_1.hex, the bootloader flashes fine. I'm able to confirm that it writes by calling the read command again. It just has a verification error on at90usb128x for some reason. I have tried on both a Windows and a Linux laptop. So I don't think the issue is my laptop setup. My Linux computer is being a little weird I think? When I run the flash command it "writes" and "reads" kind of fast before it verifies (progress bars jump to 100%.) whereas my windows laptop seems to go at a slower speed (I can see the progress bar creep up to 100%). The Planck did come in working order. It lit up, buttons worked, and everything. After the first flash to install the correct boot-loader however, it never woke up. I understand it's expected the lights wont work, but the computer wont even read keystrokes. I'm hoping it's not actually fried somehow. I do think there's life however. When I plug it in windows makes a "device connected" sound. I just can't do anything with it. I know the issue isn't with the USB cable connecting the laptop to the programmer either. I've tried multiple cables. System wide configuration file is "C:\Program Files (x86)\AVRDUDESS\avrdude.conf"
Even if you don't reply, thank you for taking your time reading this. Check the memory lock bits. 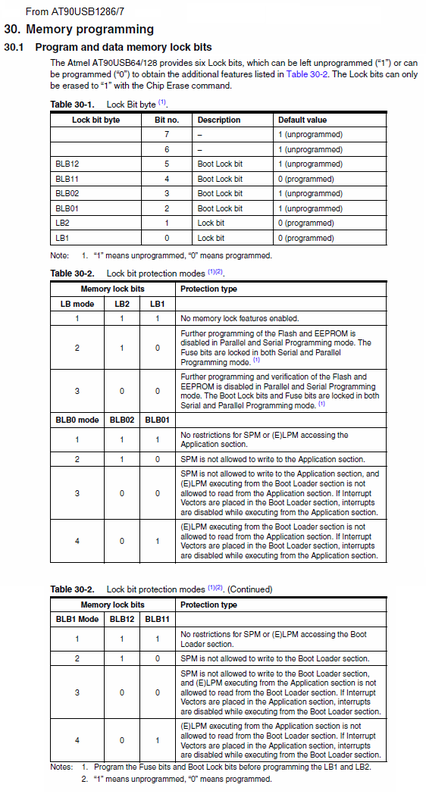 See "30.1 Program and data memory lock bits" in the datasheet. I'm sorry but like I said I'm a noob. Where's the datasheet? What version of avrdude? I seem to remember there were problems in the past with writing beyond 64K which affected "large" devices that had bootloaders at a high address. Might be worth pulling the latest source tree for avrdude and building an up to date one if the repo version for your Linux is quite old (certainly if it is a 5.x rather than a 6.x version). EDIT: I should learn to read - I see "6.1" in the output above. I think that is recent enough but I would check the release notes to see if you can spot when the 64K was fixed. If so then that was fixed at 6.0 in fact. Ah dang. That would've been nice if that was the solution. Thanks for the reply though! I submitted an issue on github and it looks like somebody else said this might be a fuse issue. If that's the case, then afaik thats in the same ballpark as the lock bits. So I suppose I'll keep trying to understand that. Thanks for the link! Yeah I found that earlier and checked it out but I unfortunately had no idea what I was looking at. It looked like that those are the correct settings when looking at other Planck Light users trying to flash their bootloader however. 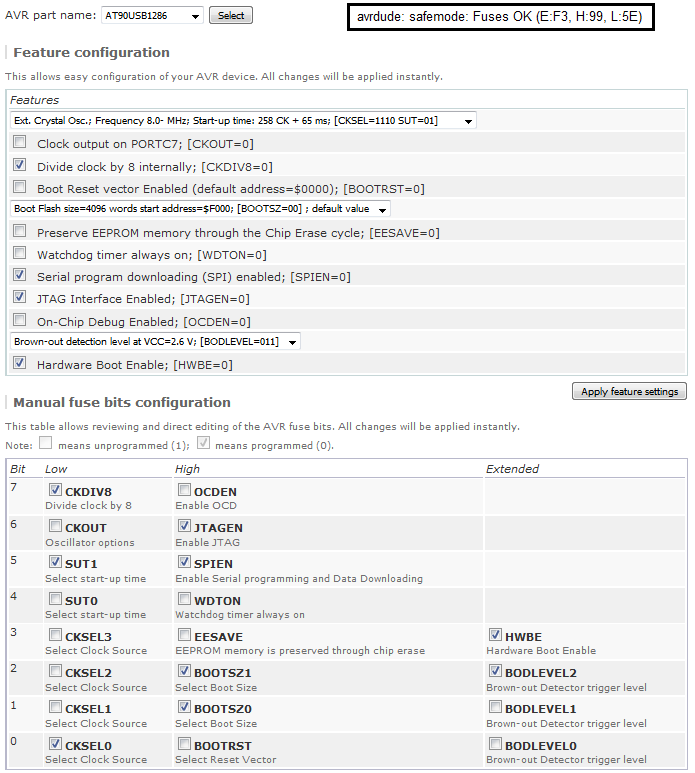 Why don't you use avrdude to read the lock byte? From avrdude user manual (LINK). avrdude: writing output file "lock.h"
Edit 2: So If I'm understanding this correctly, the bits are all set to 1 which means they're programmed? Edit 3: Just exported it to binary instead of hex because of obvious reasons... Yes the lock byte is set to 0b111111. No, it means that they're NOT programed. So it appears that the memory being locked is not the problem. Update! : After going to microcenter and getting myself a teeny, and programming the teeny so act as an ISP programmer, I was able to flash the bootloader. I'm not sure what entirely was wrong with the sparkfun avi, but that seemed to be the cause of my problems. Thank you so much for taking the time to reply to me though!! I'm glad you got it working. Thanks for the update.